So SSL in general is having a rough time lately, now with the SSLv2 DROWN attack on TLS. And this is not long after Logjam and a while since Heartbleed, POODLE and FREAK. 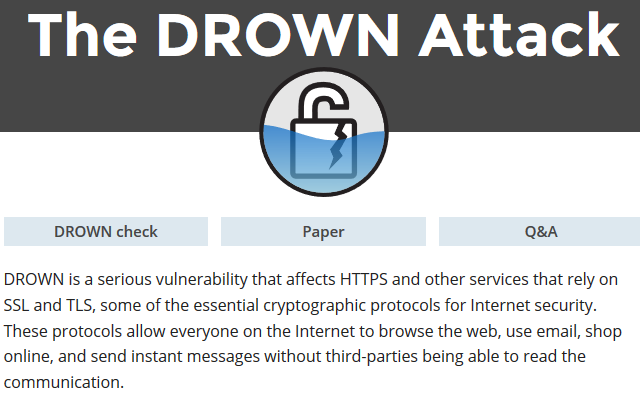 DROWN is a cross-protocol attack that can decrypt passively collected TLS sessions from up-to-date clients and stands for Decrypting RSA with Obsolete and Weakened eNcryption. In some ways this is just a new, improved, stronger version of the earlier Bleichenbacher attack. A typical scenario requires the attacker to observe 1,000 TLS handshakes, then initiate 40,000 SSLv2 connections and perform 250 offline work to decrypt a 2048-bit RSA TLS cipher-text. If any other server uses the same private key and allows SSLv2 connections, even for completely different protocol, you could be vulnerable. Many companies reuse the same certificate and key on their web and email servers, for instance. In this case, if the email server supports SSLv2 and the web server does not, an attacker can take advantage of the email server to break TLS connections to the web server. In a worst case scenario and with adequate processing power, this could mean a real time man-in-the-middle attack is possible. If you have any servers, anywhere with SSLv2 enabled – then yes. If you share private keys (that includes with a CDN provider, mail server, DNS server etc) you could be in worse trouble. Even if your web server doesn’t have SSLv2 enabled, you are still vulnerable. For most of Linux bods, OpenSSL already released a patched version of their library last Tuesday – if you haven’t already installed it please do so ASAP. On Ubuntu it’s as simple as doing aptitude update; aptitude safe-upgrade -y; and then restarting all relevant services, or simply rebooting. So go and patch, and if you’re not sure about the implications of this attack I suggest regenerating your private keys, regenerate new SSL certs and install those after patching and blocking SSLv2 from all your services. Hi, DROWN does not expose your private Keys. It exposes the session keys to allow a session to be decrypted. Please see the openssl blog posting FAQ question on that specific point – https://openssl.org/blog/blog/2016/03/01/an-openssl-users-guide-to-drown/.